Om du besöker ön Bohol i Filippinerna måste du kolla in världens minsta apa - Tarsier! 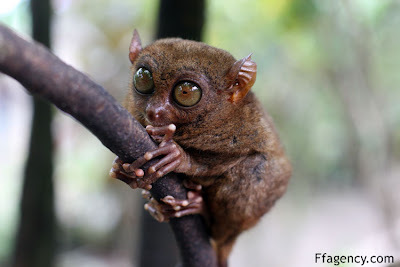 The Philippine Tarsier (Tarsius syrichta), known locally as the Maumag in Cebuano/Visayan, is an endangered tarsier species endemic to the Philippines. It is found in the southeastern part of the archipelago, particularly in the islands of Bohol, Samar, Leyte, and Mindanao. Its name is derived from its elongated "tarsus" or ankle bone. Its geographic range also includes Maripipi Island, Siargao Island, Basilan Island and Dinagat Island. Tarsiers have also been reported in Sarangani, although they may be different subspecies. Being a member of a family that is about 45 million years old, it was only introduced to western biologists in the 18th century. Ursäkta herr Tichonov, får jag ta en bild?